Erin Odom blogs at TheHumbledHomemaker.com. She’s wife to Will and Mommy to a lovely trio of redheaded girls and one sweet baby boy (yay! another boy mom!). Erin says she’s a recovering overwhelmed homemaker, and she writes about motherhood, homemaking, healthy living, and family finances. Her debut book, More than Just Making It: Hope for the Heart of the Financially Frustrated, is coming out on September 5th. I just have so much praise for her book! I’m so excited for Erin and delighted to have her as my guest today. Welcome to the show, Erin! When Erin’s family was living the difficult story she recounts in her book, she would think to herself, “God is teaching me so much. What good will come from this? If I ever make it through this time, I want to do all I can to shatter the shame and stigma of the poor.” But she never envisioned she would write a full book, and with a major publisher! Erin was raised in upper-class middle America, went to private school, and received a college education. Yet her book opens with Erin walking into the Department of Social Services to apply for food stamps. Like many of us would be, Erin was embarrassed and shocked to have found herself in that position. In fact, she says her pride was so strong that initially, she thought she would write an expose on government aid and how broken the system is. Erin’s story is one of being humbled over and over again. Book writing can be more rigorous and drawn out than you might think! Erin signed with her agent in January 2014. She took two years to write book proposals due to other professional projects. Her book was finally written in 2016, and is now getting published in late 2017. Thanks to the time between the actual living through these events and the writing of her book, Erin had already processed much of the emotions bound up in her story. She had shared bits and pieces of the story to real life friends and blog readers, and already faced much of that shame and privilege in the eye. Erin is also wisely looking ahead and anticipating critics. Especially due to the controversial nature of a few, main topics in her book – like government assistance – she knows there will be people who disagree. Erin says she’s at peace with that now, but also won’t be surprised if she sheds strong emotions when that first negative review comes! But even still, she says she couldn’t NOT have written her story. Especially for other Christians, Erin’s chief advice is to pray about the decision. Her book couldn’t have been written without lots of prayer! Also, she suggests doing a ton of research on your topic. Erin had her own story, but also she needed to research the facts to help her gain objectivity. Whatever book or business you want to produce, you’ll be influenced by what you read and listen to during the process. A couple of books, in particular, were foundational to Erin’s writing process during the proposal phase. She was very drawn to books which read like fiction, even if they weren’t! Bonnie Gray’s Finding Spiritual Whitespace was one such book on Erin’s list. Gray did offer practical tips on how to find white space, which was helpful to Erin in a time of entrepreneurial burnout, but her book was framed as a memoir. Erin really loved that feeling! Emily T. Wierenga’s Atlas Girl, was another title that gripped Erin’s attention. Wierenga’s book didn’t have a practical element, but she does chronicle her time moving around the world, alongside the story of her mother having a terminal illness. Writing this book wasn’t easy, even having always loved writing and majoring in Journalism! Erin says she thought it would be much easier to write her book than it was. Around 2015 she was in entrepreneurial burnout mode and simply longed to write. As her blog became a business, she got farther away from those writing roots and wanted to get back. Since this was her heart, she thought book writing would be easier….but it was MUCH harder. The memoir was emotionally difficult to write. There were many layers of her financial situation, and painful realities to walk through – some of those stories made it into the book and some didn’t. 18:50 – What If This Is Super Obvious? It’s tempting to think that everyone already knows the things we do. When Erin was writing the book, she incorporated many tips her parents instilled in her. Both Erin’s parents grew up in large families with not a lot of extras; and though her own father had a great job, frugal living was the norm. One major issue the Odoms discovered is that they had an income problem. A key component of her book is to identify that if you’re financially frustrated, you may have either an income problem or a spending problem. Once you know the root cause, you can find a solution. “If you have a small biz or are planning on starting one, you are steps beyond what many are,” Erin says. The idea was certainly intriguing to her! At first, Erin had absolutely no money to invest into a business. There are lots of ways to start a blog or business by investing money up front, and you usually do get quicker returns. But Erin didn’t even have $10.00 for a website domain. Her first domain literally was thehumbledhomemaker.blogspot.com. Back then, as is true now, you couldn’t monetize a wordpress.com site but you could monetize blogspot.com domains. Erin’s blog was completely DIY’ed. Though one crucial step was Erin getting into a mastermind group from the beginning. The group provided her tons of resources, one of which included a friend who was eager to design her site! It was about 2 years before Erin was making more money online than her husband made as a teacher, and it was 3 before she was making a very good income from her blog. One reason her husband didn’t make the leap to quit his job was that they weren’t sure if their marriage would survive working together!! It’s a joke, but with a bit of truth to it! The first 6 weeks of working together in early 2017 went really well…and then their 4th baby was born. As with most newborns, a family adjustment was required. But 8 months in, Erin says it’s gotten better as time has gone on. Some authors will receive a launch budget from their publisher, but not most! You have to do a LOT of marketing yourself, even with a traditional publisher. Erin did receive a marketing budget but is still pouring a lot of her own time and money into the book. One benefit of a traditional publisher Erin enjoyed is that she didn’t have to hire an editor or designer for her book. The quality of those services was very high caliber. Receiving a marketing budget depends largely on the publisher and the size of the author’s platform. But even with a marketing budget, Erin says that a publisher would not cover 100% of those expenses. The publisher may have a plan in mind, but the author will lead the way. In fact, some of Erin’s marketing ideas were covered by the publisher, while others were not. 32:44 – Why Traditionally Published? It’s possible to make more money by self-publishing if you know how to market well, so why traditionally publish? Erin says working with people has made it really worthwhile! She loves the accountability, and it fits her personality well to work with a publisher. That’s not to say she would never self-publish another book, but she’s really enjoyed this experience! Let’s talk about the book money, honey! It is traditional to get paid part of the book’s advance before even writing the book! Erin’s publisher pays the advance in thirds. She got one-third when she signed the book deal, the second 3rd upon getting the completed manuscript, and the final third when the book is published. Other publishers offer 50% upfront and 50% when the book gets published. Erin’s blog has taken somewhat of a backseat to the book, and so having that advance money is a really nice cushion as the blog is her family’s primary source of income! 35:40 Mark your Calendars for Erin’s Next Book! The upcoming book is a gift book, and it’s called ‘You Can Stay Home with Your Kids: 100 Tips, Tricks, and Ways to Make it Work on a Budget’. Actually, a team at her publishing house came up with the concept and title, and asked her if she would write it! Erin was amazed that books go up on Amazon while they’re being written! (Like the book Erin is still writing which will come out in 2018.) Why the early-bird treatment? In the book world, pre-orders are everything. 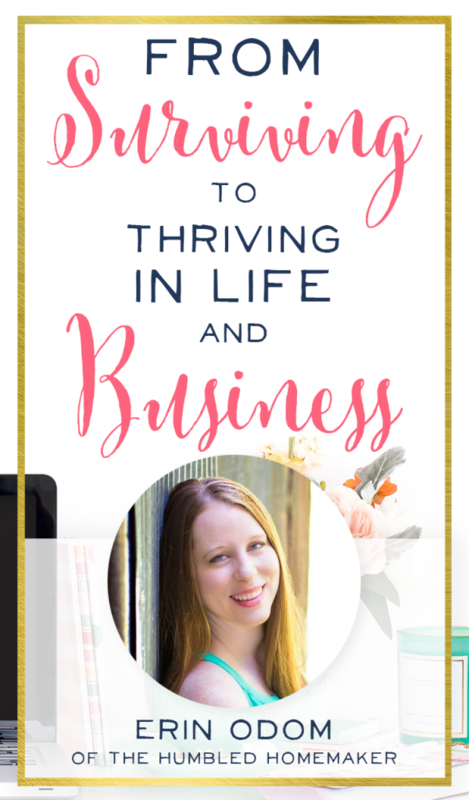 I just loved sitting down with Erin and chatting about her story, her incredible book, and her business wisdom. I hope you’ll go grab your copy of More than Just Making It, because I know you’ll find it incredibly encouraging and chock full of practical advice! You’ll have to tune in to the podcast to hear all about the sweet moments that are happening between Erin’s girls and their new little brother. So much cuteness!